This project is a finalist for the Service Design Award 2017 in the category of Professional, Commercial-student collaboration. A Glasgow School of Art (GSA) MEDes student, BDes and MIDes new graduate team partnered with the new Royal Bank of Scotland (RBS) design team for four months during 2015-16. The student team developed the company’s emerging user-centred design process and integrated a future forecasting methodology. 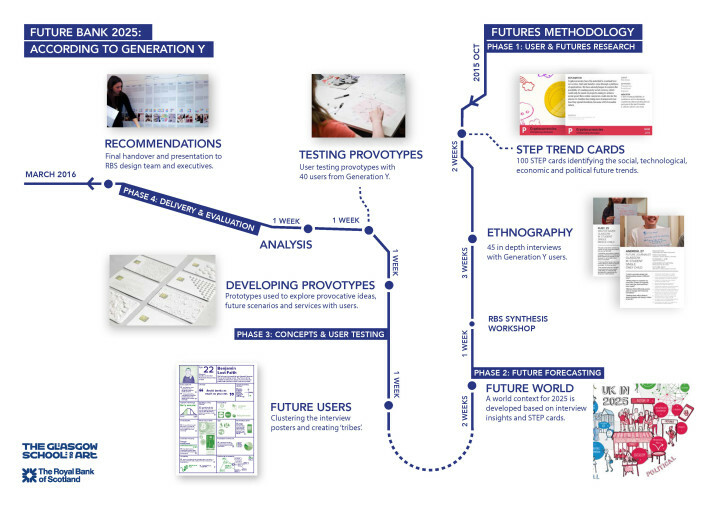 They conducted in depth user research into Generation Y and designed service concepts, personas and a future world context that continue to impact the user-centricity of RBS projects. The success of the project resulted in an innovative, industry-academic educational model being adopted by the GSA Design Department. For instance, design methods developed by the student team for RBS were integrated into the GSA Product Design curriculum. In addition, the relationship with RBS was continued and strengthened in a second collaborative project between the RBS design team and a new group of MEDes students in 2017. The Royal Bank of Scotland is a UK centred bank with over 1,900 UK branches2 and an international customer base of over 30 million.3 Following the 2008 bailout RBS recognised the challenge they faced in rebuilding public trust in their services, and subsequently established a stronger focus on user-centred design to improve customer satisfaction. RBS developed a new strategy to be the number one bank in the UK for customer advocacy and trust by 2020. Having been shown examples of MEDes projects, RBS decided an academic-corporate partnership with the GSA Design Department could be an effective way of bringing different design approaches and new methodologies into their process. In addition, they expected a collaboration would upskill RBS employees and expose them to innovative ways of tackling design problems. The RBS design team admitted there was a lack of understanding in the company about the behaviour and attitudes of young people from Generation Y aged 16-25 towards banking. 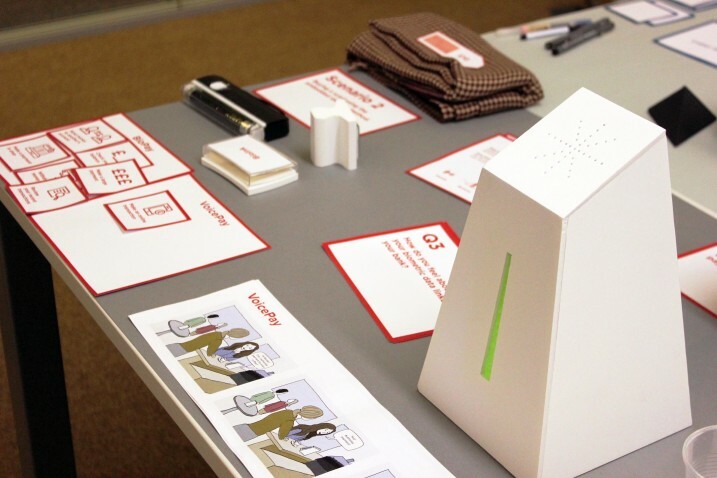 The collaboration with a student team provided an opportunity to work with Generation Y designers, and gain insight into this important customer segment through user research. The students explored future trends alongside user interviews in order to project how Generation Y values and needs could develop in the next 10 years and beyond. 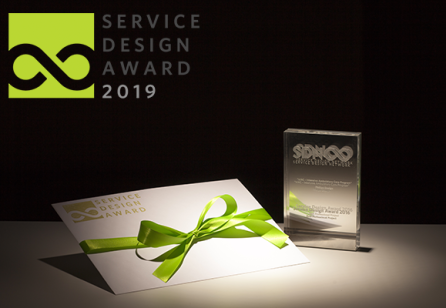 Close collaboration between the GSA and RBS design teams during the project enhanced the RBS team’s empathy for young people, as well as progressed their understanding of user-centred design and brand strategy. Within the overarching topic of Generation Y the student team researched four thematic sub-briefs from RBS, called domains, which were related to Generation Y and banking. These domains were: New Values, Safety and Security, Saving and Spending and Data. Each domain brief apart from New Values was focused on the matter level interactions which take place between users and the bank. The students led a collaborative reframing of these sub-briefs to also focus on the more value oriented and abstract, meta-level of each topic as their research indicated that ethics and values are an important part of understanding and designing better services for the target group. The GSA team approached the project by dividing it into four phases over four months. 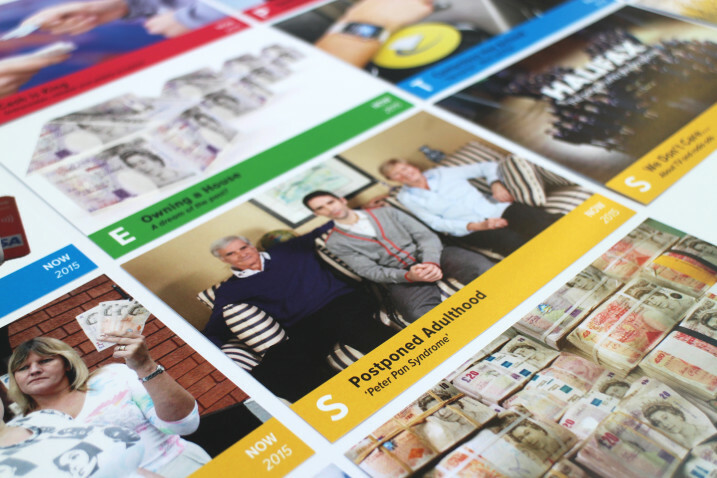 The GSA design team researched current and emerging trends relating to banking, Generation Y and the four domain areas. Key indicators and insights were framed in a timeline from pre-2000 to 2050 in order to identify gaps in the research and visualise which trends were current and which were emerging. The timeline was divided into macro trends which are global or national and micro trends which includes weak signals or counter trends. Meet-ups, workshops and digital tools were used to share progress and exchange feedback with the RBS designers. 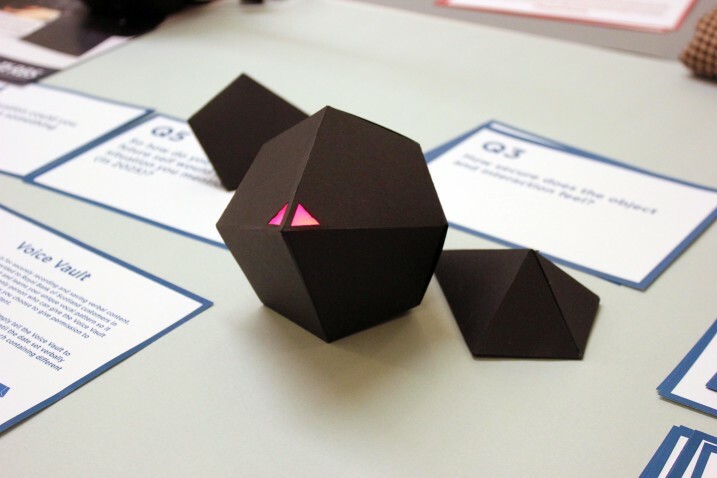 To categorise trends and communicate insights about Generation Y in a way that is usable and relatable for RBS, the GSA design team created communication artefacts at each stage of their research. The first communication artefacts were 100 visual STEP cards. These were based on the PESTEL model5 - a framework used by marketeers to analyse external factors which could impact an organisation. Each domain group developed qualitative research techniques to explore their domain theme and validate insights with 43 Generation Y users. To identify themes, interviewees were mapped according to important factors that affected their relationship towards banking such as their stage of life or financial stability. It became clear interviewee insights provided additional evidence to reinforce the trends outlined in the STEP cards. The GSA team therefore decided to use the STEP cards to create an evidence-based approach to future-forecasting and a red thread throughout the project. A collaborative, week-long workshop was developed with RBS to take place at RBS Headquarters and other sites. 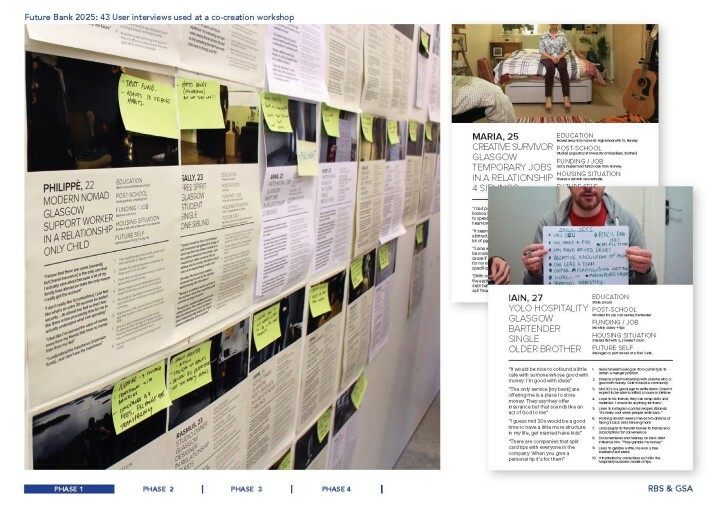 This involved contextual exploration and observation of the RBS working culture and design methods, as well as a student-run persona co-design session. 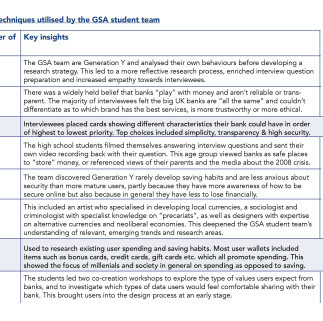 The GSA student team conveyed research findings, such as the user assumption that banks “gamble” their money. Understanding the foundations for user mistrust and misinformation helped the GSA team shape service concepts and strategic design directions from the brand (meta) level to the interaction (matter) level. The GSA team gained insight into company constraints and the level of service design experience in the RBS team. Working in context with RBS enabled the students to understand what aspects of the RBS approach should be developed and which tools would be most enriching, as well as how best to communicate their research to the wider organisation. 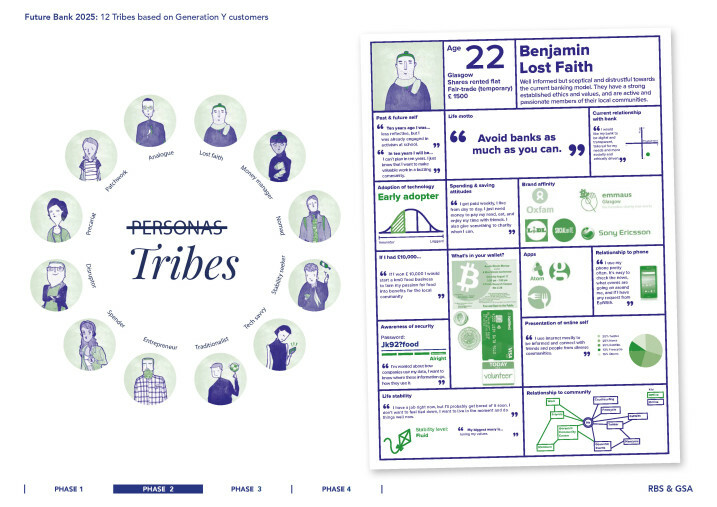 2.1 Future Users - Tribes and Chiefs: The GSA and RBS design teams redefined personas as future focused “tribes”. Tribes are clusters of interviews with commonalities between their values and life situations. Tribe chiefs were created - an archetypal user for each tribe group. Both teams felt this reframing was important because the tribe chiefs were developed from the GSA team’s own method; they are future oriented, whilst being grounded in 43 user interviews and future trends research. This level of in depth, quantitative and qualitative research had also not been present in personas that RBS had been using previously. 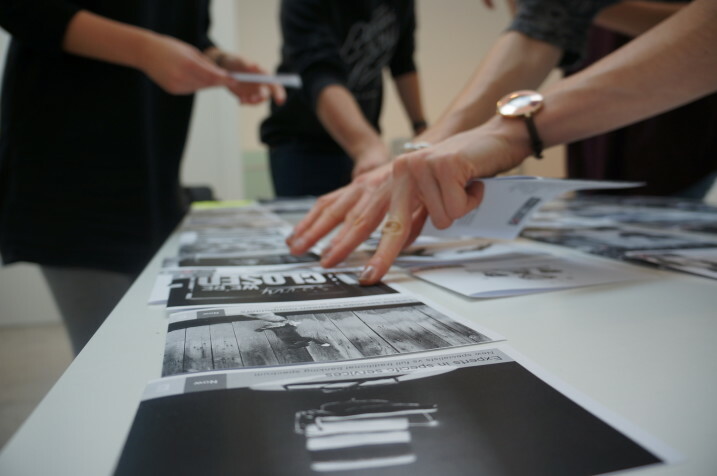 In a workshop facilitated by two GSA new graduates, the GSA design team utilised futures research methods, visualisation techniques and metaphors to deconstruct current belief systems and values evidenced in their research. They then rebuilt these layers in line with possible future scenarios, indicated by trends and user research insights, to create a conceptual world context for 2025. For instance, government welfare which users currently view as a “safety net” was reframed as a “trampoline” that helps users spring back into society. 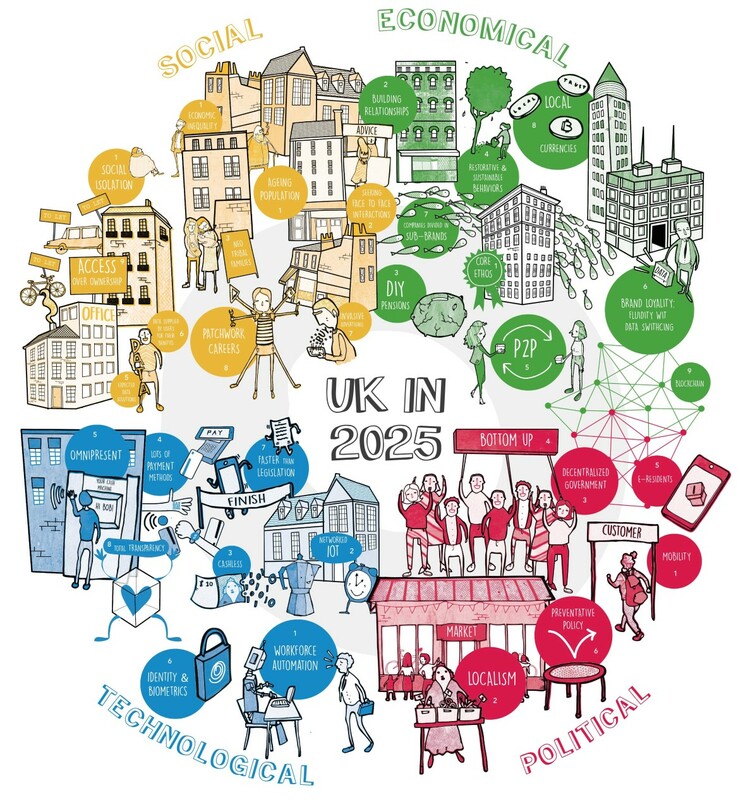 This is based on indicators for one possible future which would involve a shift towards a decentralised and localised UK Government. User experience narratives were developed from 2015 to 2025 which contextualised each tribe chiefs journey from present day to the projected future context. For instance, one tribe chief lost her job at a supermarket in 2020 due to the automisation of check-outs. Defining the life situation each chief experienced enabled mapping of users from niche to mainstream, in order to design relevant provotypes, scenarios and service concepts. 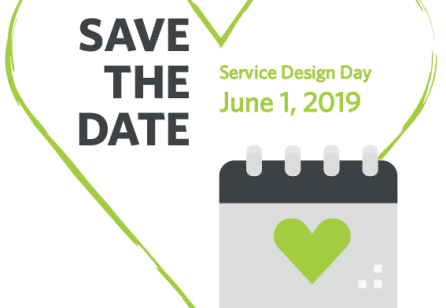 The GSA team developed service concepts which were either based on plausible future trends, or were more provocative and based on long term, possible future trends. These were materialised for user-testing as either: realistic mock-ups, provotypes (provocation artefacts), or co-creation tools accompanied by artefacts or props which communicated the future context. The GSA team facilitated multiple testing sessions of their provotypes, service proposals and future scenarios over one week with 40 users. 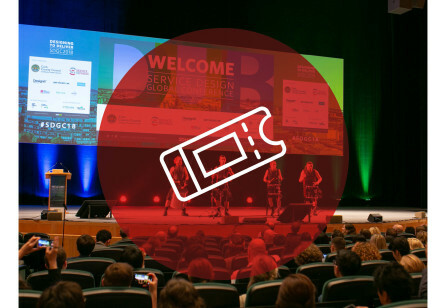 Based on insights generated when analysing user responses and interactions, design directions were created recommending how the the RBS brand and services could be further developed by the RBS design team after the project. Some provotypes the users reacted to with shock and negativity, to others they were accepting and eager to see it implemented. Both negative and positive responses provided insight not only into user service preferences and pain points, but also into their ethics and values. The GSA team developed a portfolio of material to handover to the RBS design team, which included all the research and outcomes, process documentation, key insights from user testing, an evaluation of the bank’s design methodology and new design directions. 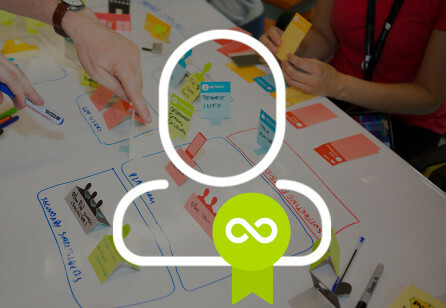 How can we create future services that offer a mutual benefit to the customer? The GSA student team presented the outcomes and process evaluation to over 30 employees at RBS Headquarters in Edinburgh from junior to executive level. The project and presentation communicated the value of user-centred design and future forecasting to RBS as a company and helped ensure design plays a central role in RBS projects. The outputs have also supported the RBS design team in evidencing how design can enable the bank to achieve its goal of being number one for customer trust and advocacy by 2020. 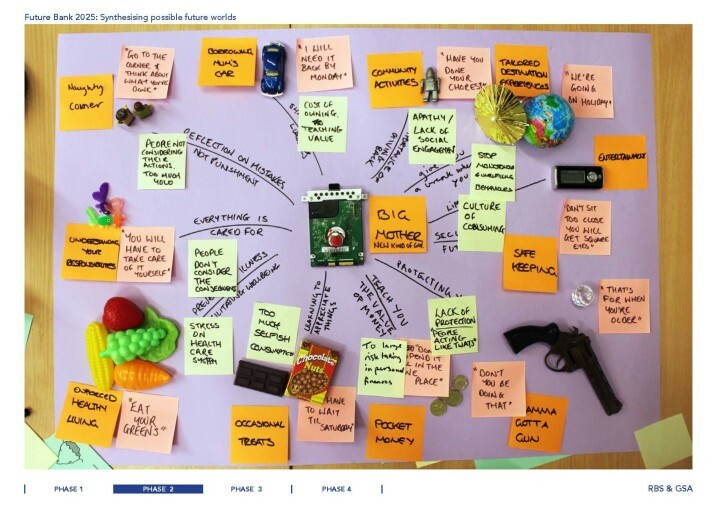 Embedding user-centred design: The project was used as an example of good design practice in the Service Design Foundation course that the RBS team developed and delivered to 250 colleagues from across RBS. This is a key part of their design education and advocacy strategy and introduced the project to employees on all levels: designers, product managers, operational teams, project management teams and technology partners. 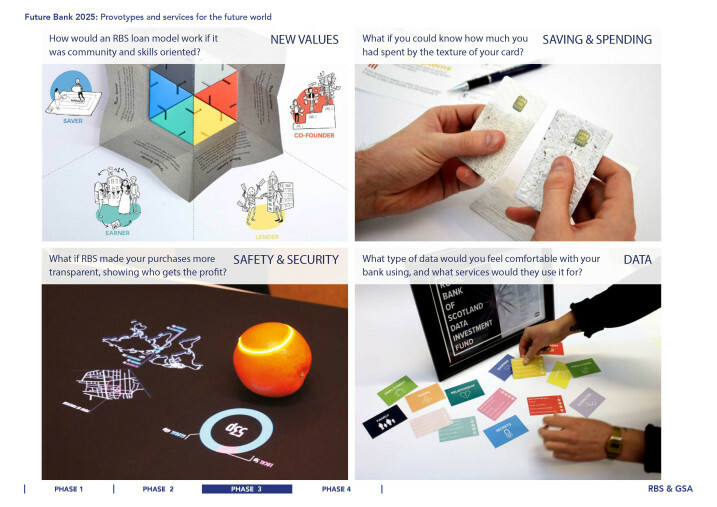 Increased market competitiveness: The project introduced a futureforecasting approach to RBS design process that is unique and innovative within the financial sector. The collaboration also helped RBS to position itself as a company interested in employing designers and helping young designers develop their skills and experience. Bespoke terminology for design transformation: The GSA team developed a terminology to support communication of new, future-focused outputs, which in turn helped shape the emerging RBS design approach. Scalable and user-centred service design: The RBS design team developed a more rigorous, empathic and user-centred service design process by “cascading the new approach through multiple RBS projects.”7 The amount of user research conducted by the GSA team, and the high quality outcomes it produced, set a benchmark in user research for RBS design teams. What if RBS made your purchases more transparent, showing who gets the profit? Institutional development: The educational model, evolved from the research methods developed by the GSA team, is being used to inform strategic projects and development within GSA. Wider educational stakeholders: The 2016 project has been presented to a wider academic audience, including the Minister for Higher Education in Scotland, as a benchmark for effective academic-industry collaboration. Pedagogical research: The GSA Academic Lead Kirsty Ross has used the experience to inform her pedagogical research and teaching practice, and has written a chapter for a book to be published in 2017 entitled Embedding Work Integrated Learning into undergraduate degrees, edited by: Associate Professor Arianne Rourke, Associate Professor Vaughan Rees and Associate Dean Graham Forsyth. Industry and Market Insight: The collaboration with RBS positively influenced the students’ perceptions of banking, and introduced them to new design opportunities within the financial sector. 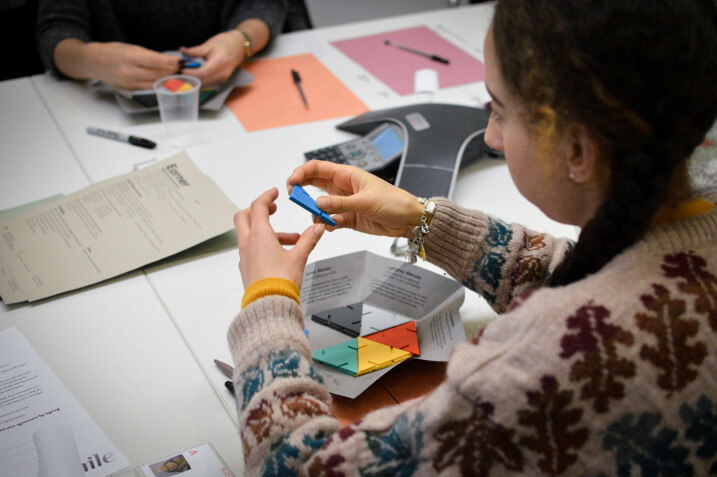 Professional Development: The project increased the students’ knowledge of how to combine service design with futures research, and how to develop new methodologies, providing valuable experience for their transition into professional practice post-academia. Learning methods: The collaborative nature of the model extends learning beyond the context of studio-based teaching to explore how different groups of learners (both academic and professional) interact and collaborate. Multi-generational, sustainable partnership: In the following academic year of 2016-17 the next generation of MEDes students continued the partnership with RBS, further developing materials from the original project. The successful outcomes of the initial collaboration enabled the new group to establish a greater level of trust with the RBS designers, as well as a deeper understanding of the company and its potential users. This continuation meant students could critique the outputs of the year before, and build on them directly. Therefore the student team behind ‘Future Bank 2025 - According to Generation Y’ successfully established a business relationship worth developing, in addition to producing research techniques and methodologies that provide a structure for both RBS and subsequent GSA students. Christopher Strachan and Santini Basra (AndThen): Led a future world creation workshop with the student team and supported integration of futures research methodology across the GSA Product Design Department. Hill, Dan. (2014) Dark Matter and Trojan Horses, A Strategic Design Vocabulary, Strelka Press Lawrence P. Carr; Alfred J. Nanni Jr. (28th July 2009). Delivering Results: Managing What Matters. Springer Science & Business Media. p. 44. ISBN 978-1-4419-0621-2.